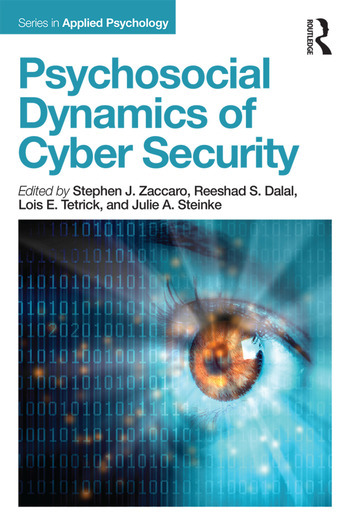 This new volume, edited by industrial and organizational psychologists, will look at the important topic of cyber security work in the US and around the world. With contributions from experts in the fields of industrial and organizational psychology, human factors, computer science, economics, and applied anthropology, the book takes the position that employees　in cyber security professions must maintain attention over long periods of time, must make decisions with imperfect information with the potential to exceed their cognitive capacity, may often need to contend with stress and fatigue, and must frequently interact with others in team settings and multiteam systems. Consequently, psychosocial dynamics become a critical driver of cyber security effectiveness. Chapters in the book reflect a multilevel perspective (individuals, teams, multiteam systems) and describe cognitive, affective and behavioral inputs, processes and outcomes that operate at each level. The book chapters also include contributions from both research scientists and cyber security policy-makers/professionals to promote a strong scientist-practitioner dynamic. The intent of the book editors is to inform both theory and practice regarding the psychosocial dynamics of cyber security work. Stephen J. Zaccaro is Professor of Psychology at George Mason University, USA. Reeshad S. Dalal is Chair of the Psychology department and Associate Professor of Industrial and Organizational Psychology at George Mason University, USA. Lois E. Tetrick is Professor in the Industrial and Organizational Psychology Program, George Mason University, USA. Julie Steinke is a Postdoctoral Research Fellow in the Industrial/Organizational Psychology Program at George Mason University, USA.